New stacklights from Edwards Signaling excel in performance and quality! 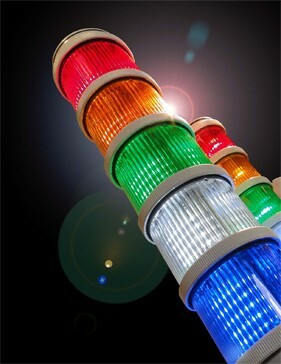 Edwards Signaling is pleased to announce the introduction of its new 200-Class stacklights. This innovative family of signals take the versatility of stacklights to a whole new level with modular convenience in five different sizes that deliver the stacklight you need in a matter of seconds – without the use of tools. 70mm and 48mm devices employ the exclusive, vibration-resistant Safe-Lock™ locking ring mechanism... just insert, push and twist – it’s that simple. Assembly is also a snap with the smaller 36mm stacklight, thanks to their unique snap-in-place modules. Each size of light and sounder module fits together in virtually endless combinations of lens color, light source, sound pattern and operating mode. This wide range of options allows customers to configure precisely the right stacklight for each specific application. But the benefits of 200 Class stacklights don’t end there. These innovative signals also excel when it comes to performance, safety, and reliability. Lenses are crafted of extra-thick, optical-grade, UV-stabilized, self-extinguishing polycarbonate, providing a high degree of durability and impact resistance, while ultra-bright LightPoint™ LED light engines ensure optimum visibility in even the most challenging environments. Brilliant.